The dialogue in the scripts for these two episodes (by Evan Reilly and David Leslie Johnson respectively) is a step up from recent instalments. 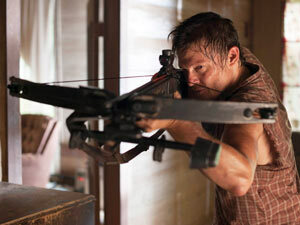 Each contains key moments or conversations that concisely get to the heart of the drama or the characters, with redneck Daryl being a particular focus. Cherokee Rose sees him make some progress in the search for Sophia, finding a ‘Cherokee rose’ that signifies the lament for lost children along the way. He gives the flower to Carol and delivers a great speech in the process. The more full-on and comedic attempt to tackle the zombie in the water supply is a centrepiece of the episode (although it points up the lack of zombies generally in this series). Lori’s self-diagnosed pregnancy and the figure of Glenn as the bearer of secrets continues into Chupacabra. While Daryl gets himself trapped and sees visions of dead brother Merle, Glenn deals with the fallout of his ‘encounter’ with Maggie and his knowledge of Lori’s condition. Once again, zombies are thin on the ground, with Daryl encountering a couple before being mistaken for one himself and almost shot by trigger-happy Andrea. Verdict: The Walking Dead is still good drama, but it seems like its ambition has been significantly lessened since the first series.